What makes a tablet good? Design, graphics, performance? 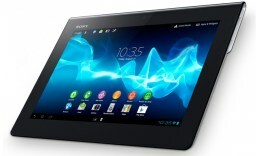 Sony Xperia Tablet S has it all. ou probably already know it – Digital Magnet is all about knowing and being up-to-date with all the latest innovations in the infinite technology world. And yes, it’s our passion to test them and show them to you in our video reviews. In today’s digital world when mobility is combined with productivity it equals one single category – tablets. The total storage capacity available for the Sony tablet users is 16/32/64 GB but an SD memory expansion card slot is available as well. The one word that best describes the machine you are looking at is “Sony” and to be more specific “Sony Xperia tablet S”. What makes a tablet good? Design, graphics, performance? Well, the machine you are looking at has it all. It features the quality and style one would expect from this brand and what is more important it all comes at a competitive price. The body is black, sleek and smooth, made of both aluminum and polycarbonate. It stands out from the common tablet designs because here Sony has bet on a pretty unusual shape that resembles a “folded-back magazine”. It is a pretty interesting decision we all agreed during the test period. This design feature makes it extremely comfortable as it provides a comfortable typing angle especially when the tablet is in a horizontal position. Having mentioned the word comfortable we should not forget to underline its compact dimensions of 239.8×174.4×8.8 mm and a weight of only 570g. The well-known and easy-to-navigate operating system Android 4.0 is in charge of the working process in the Sony Xperia tablet S. The mobile machine is also equipped with a Quad-Core NVIDIA Tegra 3 mobile processor at 1.4 GHz frequency. The tablet’s internal memory is 1 GB. If you like to cook and experiment in the kitchen, trying new recipes that you found online then you have the perfect cook book because the new Sony Xperia tablet S screen is splash proof. Unfortunately “splash proof” here doesn’t mean “waterproof”, but the good news is you no longer need to worry about touching the tablet with wet hands. The display itself is a TFT color LCD capacitive multitouch 9.4’’ screen. The resolution is 1280×800. The sensors are very sensitive and respond immediately. For the protection of your screen Sony have provided an oleophobic coating. The opticontrast technology provides enhanced graphics.Opticontrast is actually Sony’s trade name for a glass cover sheet that is optically bonded to the underlying LCD. The two stereo speakers are positioned on the back side of the tablet and our sound test left us feeling quite positive about the sound quality, having in mind that after all it’s a tablet. But just a hind if you want to enjoy a crystal clear sound, then we would recommend you to use the 3.5mm audio output that you will find on the periphery of the device. The total storage capacity available for the Sony tablet users is 16/32/64 GB but an SD memory expansion card slot is available as well. Among the multiple interesting features you will find inside the Xperia tablet S is the one that converts your tablet into a universal IR remote control. Forget about hunting down every single remote, now you are in charge of your entertaining home universe. The video call experience is supported by two cameras: a front 1MP camera shooting video at 720p and an 8MP rear-facing primary one with autofocus, geotagging, touch focus and face detection. You can check out this camera’s performance for yourself from the test photos in our gallery. One of the most important things for a portable machine is the battery life. The li-Ion 6000 mAh battery of the Sony Xperia tablet S supports up to 12 hours of multimedia experience. Among the applications that come with the Sony Xperia are Evernote, the music application Walkman, Sociallife and many more entertainment and business Android applications.